Sure, Robin Williams, who has been found dead at his home aged 63, had his demons with drugs, drink – and like so many comedians – depression. But that certainly doesn’t mean his death is any less shattering or was generally met with less disbelief when it was the first thing that met my eyes and ears as I awoke to the news. Famously, he cites the death of fellow comedian John Belushi as a wake up call to his drug consumption and he freely admitted that if The Blues Brother hadn’t died then it probably would have been Williams next. Like many, I grew up with him, first on my TV screen on Mork and Mindy, then on several of his live shows and of course his big screen antics way before he hit it big in Good Morning Vietnam in 1987, which seems like a lifetime ago, but seemed to capture the persona of Williams perfectly – the zany comic against the establishment and the thoughtful man that cared for others. Williams was both of these and pretty much the rest of his output moved between the two with great success in the likes of Aladdin, Mrs Doubtfire and even Dead Poets Society. He’ll, of course, always be remembered for his manic style – an interviewers dream and nightmare no doubt – and his amazingly fast comedic processor that saw improv with hilarious results in such classics as Aladdin, Good Morning Vietnam and Mrs Doubtfire, that just shows his sheer diversity there. But these were tempered with more thoughtful performances in Dead Poets Society, Moscow on the Hudson, and in one of my own personal favourite films, Awakenings. Not to forget his best supporting actor Oscar nod for Good Will Hunting of course, Williams also received nominations for the afore-mentioned Vietnam, Society and The Fisher King. There was often sadness in this clown’s eyes during his performances, whether that be the desperate father to see his children, the doctor who couldn’t help in Awakenings or the ‘little boy lost’ or ‘boy who never grew up’ figure in the likes of Jack, Jumanji and of course Hook as Peter Pan himself. And in the latter, for me, it was the grown up Peter in the real world that bookended the film that was the most interesting element of that film. And his performances in darker material such as Insomnia, this time acting against Pacino, and One Hour Photo just showed the man’s range and ability to act, he was no one trick pony. And that range was matched by the diverse range of films and genres that he found himself leading audiences, of course there were always the comedies but I’ll remember him as much for his dramatic roles, roles such as that in What Dreams May Come where he finds himself looking for his wife in the afterlife – which has never looked so vivid and rich – after she has committed suicide. It’s poignancy elevated beyond belief now of course, it is a beautiful film to look at and certainly won’t be easy viewing when it is next watched. Ironically I was watching the original Night at the Museum the night before his death and he is brilliant as Teddy Roosevelt (essentially in that he is the elder statesman of comedy) and he fills his supporting performance – always making it feel bigger than it actually is – with what makes a Williams performance great, full of warmth, humility and fun. He of course played another President, Eisenhower, in the recent The Butler (2013). It’s pleasing (if that is the right word) to see that Sky, the BBC and Channel 4 are all remembering the talent of Williams with a selection of his most beloved films. All, for one reason or another, will be difficult to watch because of the man and the talent that we have lost and many of his performances will now resonate more loudly and deeper than they ever did before. The ‘zany character’ of Robin Williams that we saw on the big screen, on stage or on the chat show was just that, a character and he played it well and brought so much joy to others of all ages. My favourite ever story though is that when Steven Spielberg was making the harrowing Schindler’s List he’d come back from an emotionally draining day of filming and speak to Williams via video link up who would just cheer him and other crew up, bringing some sunshine back into the darkness. I’m sure all of us who have been made to laugh or been moved by one of his performances just wished that we could have done the same for him. His light might have dimmed but his power to make us laugh and cry, or even cry with laughter, has just been forever heightened. What’s your favourite Robin Williams moment? 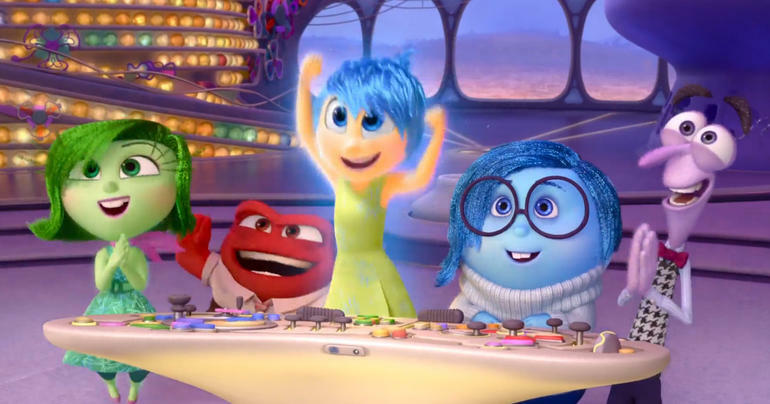 Disney Pixar’s latest is just wonderful and Inside Out is perhaps its richest film since Up! It packs a similar emotional punch with a feeling of elements of Wreck It Ralph and really does make you think…a lot. It’s a particularly deep and thought-provoking film, period, never mind for animation. It’s hard to not think about your emotional actions in an entirely different way post viewing. It really does strike a massive emotional chord, whether you are watching it as an adult or a child. But at the same time it is seriously joyous, funny and thrilling at the same time and boasts some excellent set pieces that really ramp up the tension. And at some points it’s really difficult to figure how things are going to play out for the characters, constantly pulling the rug out from underneath you. Initially the concept seemed a little The Numbskulls, as we inside the mind of 11-year-old girl Riley, but this is quickly transcended to deliver an animated film at its peak with some really deep and meaningful ideas about memories, what makes us us and what makes us tick. It’s very much a film about the difficulties of growing up and is as powerful a coming of age drama as the likes of the Oscar-winning Boyhood. And this must be a dead cert to take home the Animated Feature statuette next year. 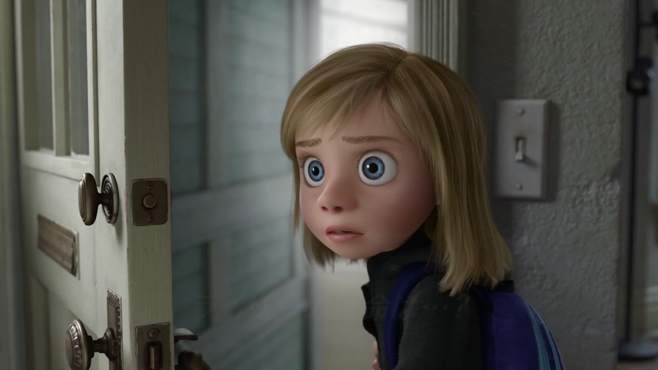 The characters inside the head of 11-year-old Riley, Joy, Sadness, Fear, Anger and Disgust, pretty much describes that emotional roller coaster that the viewer goes through and at the same time we get emotional and story echoes of the likes of Monsters Inc, Wreck It Ralph, Toy Story 3 and Up! These are films that we just don’t watch and enjoy, they teach us key life lessons. It’s little wonder then that the film’s main director is Pete Docter, who also helmed the first Monsters film and Up! But this is no carbon copy of the aforementioned. You’ll also be sure to have a little something in your eye over a certain part elephant, part candyfloss character and the lighting and emotion in the ‘real world’ scenes, especially the journey to the bus depot in drab San Francisco, also packs a powerful Pixar punch. Riley’s world (head) is in contrast all about colour and has some amazing concepts and look wonderful and work wonderfully, part Wreck It Ralph, part Metropolis via way of Tron Legacy. I don’t think I’ve ever thought about wanting an ‘Art of’ book so much, although having read reviews they lack commentary which is a crying shame and much missed opportunity. All of it deftly underlined by a touching and exhilarating Michael Giacchino score that really fittingly plays the emotions in our head. The four-year old (nearly five) I watched it with really rolled with the gamut of emotions and afterwards was talking about the characters of emotions of joy, anger and sadness and how ‘the people in her head’ were with such things. It ensuring that this film will resonate with parents and children, and even those who are not, long after the credits have rolled. We’ve just recently moved house and after the summer our daughter, Isabelle, is moving schools, so it was difficult to not think Riley as Isabelle at times. Perhaps it is unsurprising then that according to IMDB psychologists and other experts were consulted so the writers could make the way Riley’s mind works scientifically accurate. For example, it is believed that short-term memories made during the day are converted into long-term memories during sleep, which is what happens in Riley’s mind. This is something seriously special and even as it unfolds you know you are watching yet another bonafide classic. Dreamworks can’t even begin to touch this output. A special mention must also go to the sublime Lava, that precedes Inside Out, about a singing volcano that provides a pyroclastic flow of emotions and does for volcanoes what Blue Umbrella did for brollies.